The United Nations human rights chief today condemned the recent violence in Venezuela, and urged the Government to ensure respect for freedom of expression and peaceful assembly. In a news release issued by her office (OHCHR), Ms. Pillay also voiced deep concern at the reported excessive use of force by the authorities in response to protests, including yesterday in the capital, Caracas. She unequivocally condemned the violence leading to death and injuries, irrespective of the perpetrators, and called on all sides to renounce violence. At least 140 people have been injured and 13 people have died since the beginning of the unrest, according to the General Public Prosecutor. Noting that 11 police and intelligence officers have been arrested in connection with violence during the protests, Ms. Pillay urged an impartial, full and independent investigation into every case of death and injury, and for those responsible to be brought to justice. OHCHR said that, according to the latest known official figures, 579 people have been arrested since the unrest in the country began earlier this month. “I am concerned that a very large number of people have been arrested and we have reports indicating that some of them are being held incommunicado. I urge the authorities to ensure that people are not penalised for exercising their rights to peaceful assembly and to freedom of expression,” said the High Commissioner. She added that concrete action by the authorities, including through full and independent investigations, releasing peaceful protestors who have been detained, as well as disarming armed groups, will go a long way towards defusing tensions and paving the way for resolving the crisis. Earlier this week, Secretary-General Ban Ki-moon voiced his sadness at continuing reports of violence and loss of life amid protests in the South American nation, and urged that all efforts be made to lower the tensions and prevent further violence. “He hopes for concrete gestures by all parties to reduce polarization and create the necessary conditions to engage in a meaningful dialogue so that calm can be fully restored in the country as soon as possible,” Mr. Ban’s spokesperson said in a statement. 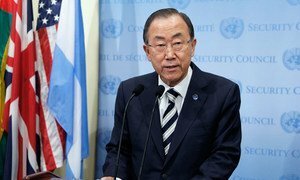 Secretary-General Ban Ki-moon today voiced his sadness at continuing reports of violence and loss of life amid protests in Venezuela, and urged that all efforts be urgently made to lower the tensions and prevent further violence.